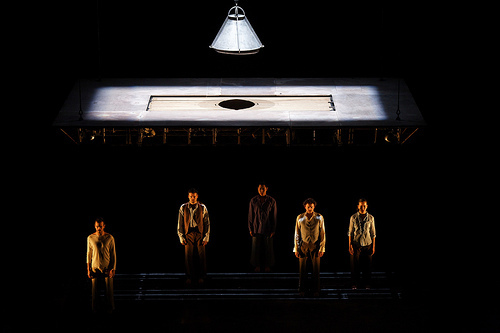 Presented in association with the London International Mime Festival, conceived by a circus creator and inspired by Steinbeck’s Of Mice and Men (according to the website), Compagnie MPTA’s Du Goudron et des Plumes is far from the usual type of show that I would attend. But, the Barbican’s programming, especially under the Bite umbrella, has been so reliable for me in recent years that the plunge was taken and well, it turned out to be a most unexpectedly viscerally exciting evening. Translating to Tar and Feathers, the show, conceived and directed by Mathurin Bolze, takes place on, under and around an amazing platform which is almost constantly moving, whether swinging from side to side, rising up to the heavens or tipping precariously at an angle. The cast of five artists, including Bolze, find themselves on this platform and have to work together to try and keep some stability in this new uncertain world, as they explore the development of friendship and trust as necessary tools to exist as part of humanity, and what happens when competitiveness gets the better of co-operation. I have little experience of this genre, I suppose you would call it physical theatre as it is something more than dance, more than just circus and not like any kind of mime I’ve seen before, thus I don’t really feel I have the vocabulary to talk about it in as expressively a way as I am learning to discuss theatre. So I have to say thanks to the lovely Sue, my companion for the evening, who gave me a framework to start from and helped me to articulate my thoughts. It is all quite loose and open to interpretation though, there’s no strong narrative pull here, and this actually really helped to focus me in on the simply amazing adventurous feats that were happening on the stage. To someone who has never seen a Cirque de Soleil show, this was just jaw-droppingly exciting, physically outstanding and totally engrossing to watch, weaving in human drama, comedy, danger with moments of sheer beauty, creating patterns out of chaos, bringing some kind of order to this universe, this strange unknown platform with its ever-changing undulations, its rise and fall and the endless manipulations of its format as poles, planks and parts are moved and replaced to create a constantly morphing uncertain environment. The connection to Steinbeck is certainly not explicit and probably served as a starting point for the development of the work more than anything. Thinking about it, I think you could read elements of the journey that Lennie and George take together in learning from each other could be mirrored here in the growing trust that emerges on this platform but it is a goodly while since I read the book and I was secretly glad that none of the tragic aspects were incorporated here. Rather, what we did get was a fantastic journey into the world of physical theatre and the vast possibilities that lie therein. Tsirihaka Harrivel’s flexibility in the opening acrobatic sequence was impressive as he wrapped himself around poles and planks of wood, he also had the funniest routine of the evening strapped upside down mirroring Erwan Ha Kyoon Larcher’s movements though gravity meant that drinking a bottle of water wasn’t quite as easy for him! These two also worked well together in a pole act, making the most of their almost clownish interplay. I liked the paper section too with its shadow work and twisted perspectives distorting our perception of what was happening. The section as the platform swung from side to side and there was a dance of changing seating positions and attempted human contact was so intricately and cleverly done, probably my favourite moment, though Mathurin Bolze’s quiet work on the floor with a chair and duetting with Tom Neal was just beautiful to watch. Marroussia Diaz Verbèke as the sole woman also impressed throughout, a funny routine showing the impracticalities of high heels was well done and her rope and aerial work left me breathless with its daring. But these are just some of the moments that make up this stunning whole. There were other segments when all the artists were working together that really caught the attention too, whether exploring the platform at the beginning, testing its limits and bounding around on trampolines and swinging on the ropes, or pulling together to save each other as the chaos rises to overwhelm them with detritus falling all around and the platform threatening to tip them all off. With a pulsing original electro-based score from Philippe Foch and Jérôme Fèvre and effective lighting from Jérémie Cusenier and Christian Dubet working perfectly with Goury’s most ingeniously designed set, this was a perfect introduction to the possibilities of physical theatre and even if you’re not too sure about it, it is a brilliant opportunity to do as the Barbican says and ‘do something different’, it really will be worth it.